Photo: Moses Brown House, ca. 1785, 7604 Ridge Road, Eldersburg, Carroll County, MD. Listed on the National Register of Historic Places in 1980. Photographed by User:Acroterion (own work), 2008, [cc-by-3.0 (creativecommons.org/licenses/by/3.0)], via Wikimedia Commons, accessed February, 2013. Carroll County Government offices are located at 225 North Center Street, Westminster MD 21157; phone: 410-386-2400. Carroll county was formed in 1836 from the counties of Baltimore and Frederick, between which it lies, with Howard on the south and Pennsylvania on the north. The county has an area of 437 square miles and was named in memory of Charles Carroll of Carrollton, who died in 1832, the last survivor of the signers of the Declaration of Independence. The surface is diversified, being level, undulating, or broken, watered by fine streams issuing from innumerable springs which make up the tributaries of the Potomac, the Monocacy, and the Patapsco. These streams furnish motive power for cotton and woolen factories, and many flouring mills. The soils being limestone, slate, and iron, are fertile and easily improved. These lands respond bountifully to the efforts of the agriculturist, and the products are corn,wheat, rye, oats, buckwheat, hay, and potatoes. In many sections grazing is fine, and dairy farming is profitable. Limestone is quarried in large quantities for making lime; and granite, marble, and brownstone furnish excellent building material. Iron, copper, soapstone, and flint are found in quantities sufficient to be worked with profit. Ample facilities for speedy and satisfactory transaction of business are furnished by fourteen banks, in which the deposits amount to between two and three million dollars. Westminster, with a population of 3,496, is the county seat. Other towns, ranging in population from 1,200 to 500, are Union Bridge, Taneytown, Manchester, Hampstead, Sykesville, New Windsor, and Mt. Airy. Carroll was the first county in the United States to establish rural free delivery of mail. In 1899 the system went into operation, and at present four wagons and forty-six carriers distribute mail in all parts of the county. The Western Maryland, Baltimore and Ohio, and Frederick Division of the Pennsylvania, are the Carroll railroads. 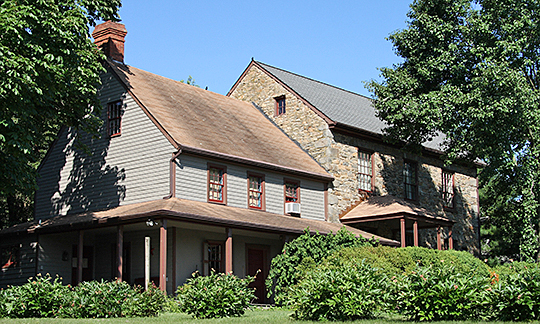 The Western Maryland College and the Westminster Theological Seminary of the Methodist Protestant Church are at Westminster, and New Windsor College at New Windsor.